U.R. The Star brings personalised gifts to the next level! With just a photo anyone can star in their own cartoon adventure! 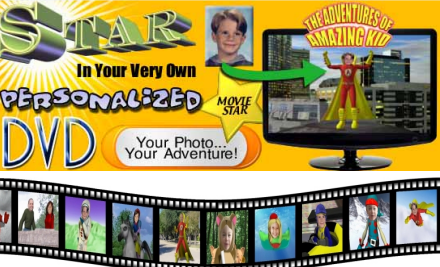 We transform your child or loved one into an adventure hero in full color 3-D animation. All we need is an e-mailed photo. There are 8 amazing titles to choose from, and in each one – YOU are the star, YOU are the hero! U.R. The Star DVD’s make great, unique gifts. A picture is worth a thousand words and a photo personalised DVD leaves them speechless!